A beautiful introduction to growing and cooking with the variety, deliciousness, and healthfulness of Chinese cuisine! Wendy Kiang-Spray’s family has a strong culinary and gardening tradition. 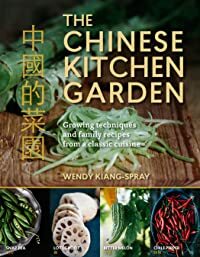 In The Chinese Kitchen Garden, she beautifully blends the story of her family’s cultural heritage with growing information for 38 Chinese vegetables—like lotus root, garlic, chives, and eggplant—and 25 traditional recipes, like congee, dumplings, and bok choy stir-fry. Organized by season, you’ll learn what to grow in spring and what to cook in winter. This gorgeous book gives the reader unparalleled access to the Ruth Bancroft Garden, an outstanding public garden in northern California. Packed with practical information on plant choice and design and filled with exceptional photography, The Bold Dry Garden empowers readers to confidently create a garden that is lush, waterwise, and welcoming. It also celebrates one of the premier public gardens in the country and the extrordinary woman who founded it.